It was a night in which you got an ink stain on your new blouse, your hot dog with all the fixings fell out of the bun onto a sawdust floor, your brand new car was backed into, Dennis Rodman said he was engaged to your daughter. Nothing fatal, but such an empty feeling, nonetheless. 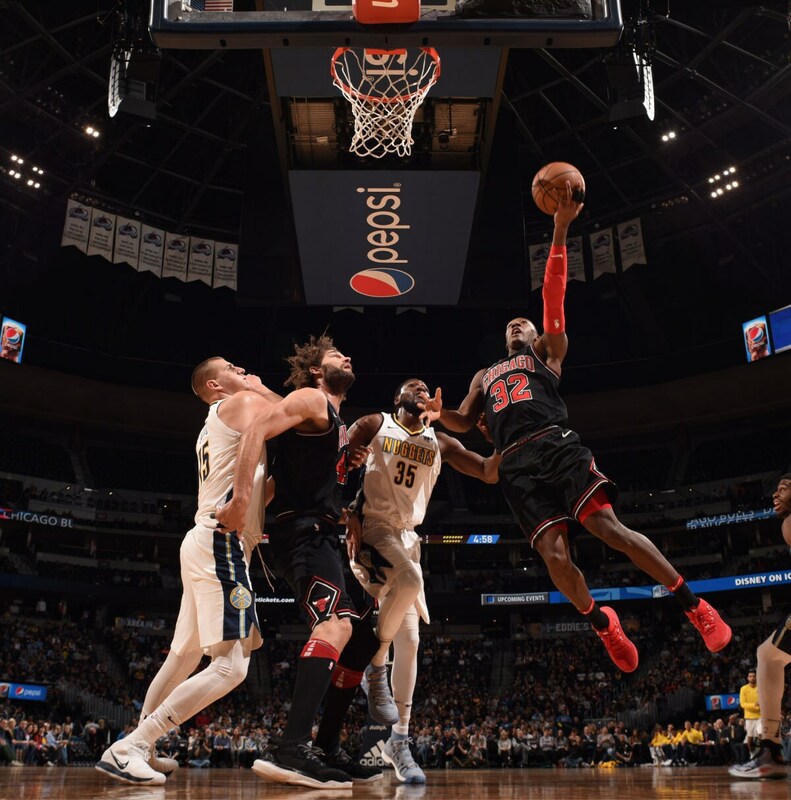 The Bulls Thursday played as well as they have all season, having their best shooting game of the season, equalling the most inside points they've scored, flirting with their most assists of the season and making a shot to go ahead, a brilliant Kris Dunn driving score over Kenneth Faried with 9.6 seconds left. Basically doing everything but winning the game as Denver's Will Barton with a career high 37 points slashed for a game winning layup on a shocking defensive breakdown with 3.2 seconds left for a 111-110 Nuggets victory. It's tough to get over devastating losses like this. But we have to bounce back tomorrow; we play in 20 hours. Got to come out with great energy and the right mentality. 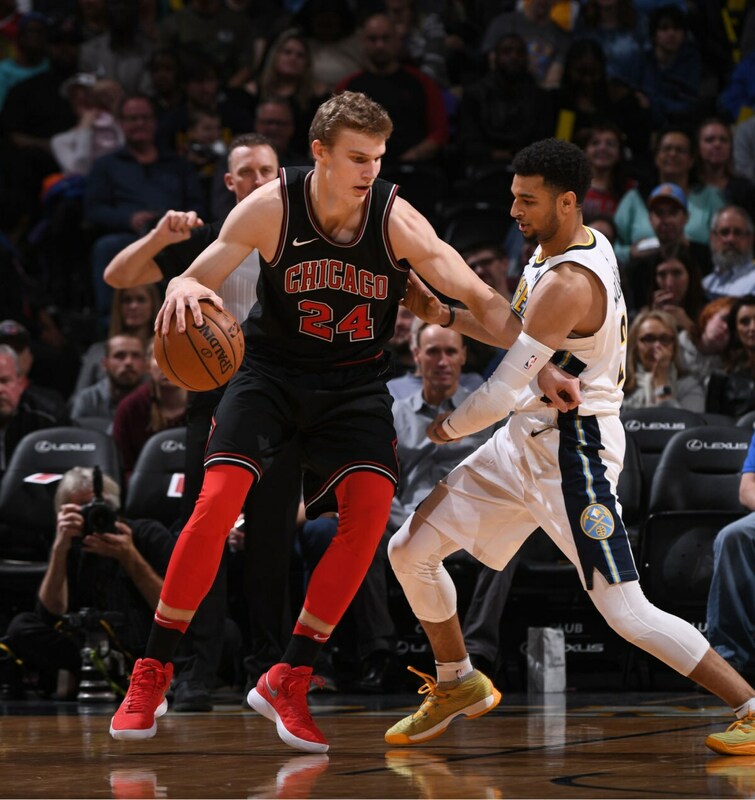 The Bulls got 20 points each from Lauri Markkanen and Robin Lopez, 19 points from Dunn and 16 points from Justin Holiday. They shot 53.7 percent, had 56 points in the paint and 25 assists. Dunn and Jerian Grant combined for 11 assists and one turnover. The game was tied seven times with 10 lead changes. The Bulls needed it to be nine. "The thing I talked about in the locker room is it's hard," said Bulls coach Fred Hoiberg. "It's tough to get over devastating losses like this. But we have to bounce back tomorrow; we play in 20 hours. Got to come out with great energy and the right mentality. I told them as soon as you walk out of this locker room to get over it. It should hurt, but as soon as you walk out we are on to the next one." And so it goes in the relentless NBA. But this one was especially difficult for a Bulls team now 3-17, a game in which the Bulls were near perfect early with an 18-point first quarter lead, a game in which they surrendered the lead in the fourth quarter but came back twice to go ahead, the last time with that Dunn score. "The big was on me, so I tried to attack him," said Dunn. "But really tough (loss)." 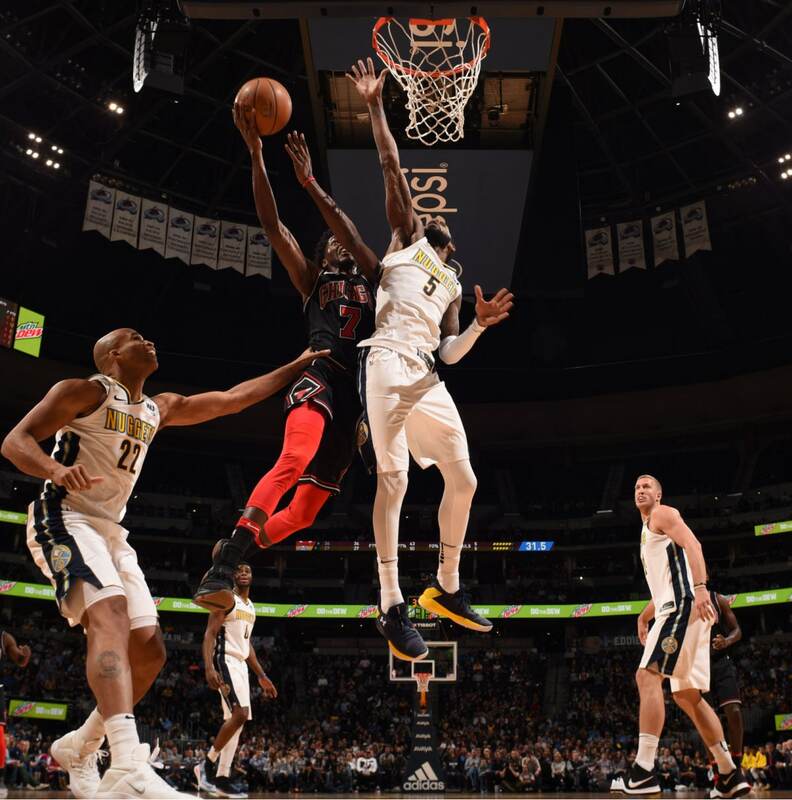 Especially for Justin Holiday, who had an uncharacteristically brutal last few minutes, fouling Barton on a long three with 45 seconds left and the Bulls leading 108-105, and then shading the wrong way on Barton's last full court drive that enabled the Nuggets' backup guard a freeway sized lane to the basket for the winner. "I pretty much didn't do my job, let my teammates down; that's it. I knew what I was supposed to do in that situation, stay in front of him. Very disappointing. That's a game won; we had that game in the bag. Three big plays I'm a part of. Just hurts a lot because I felt like I let my teammates down. Obviously we didn't get this one taken care of, and that's on me. "Continue to play like that and we should have a good chance of winning games," Holiday continued in the self flagellation. "We did everything we were supposed to do do win that game. I just have to hold up my end." It was unselfish of Holiday to take that level of responsibility, though certainly unnecessary. Everyone knows games are decided in so many ways at so many times, sort of like the crossroads of life. Step one way and there are riches and step another and there's defeat. It's just that there have been so few games of this quality this season for the Bulls, now losers of 12 of 13. And in a place where it has been so difficult for the Bulls to win, even when they were contenders. The Nuggets had won 10 straight at home and 16 of 17 against the Bulls in the Rocky Mountain mile high setting. But this time it was Bulls almost all the time, from the start and despite a bit of a third quarter gasp coming back to lead after three quarters and again down the stretch on big plays by Dunn and Markkanen. "We took a step in the right direction the way we went out and competed and I thought we did for 48 minutes," said Hoiberg. "I thought we really had a competitive edge to our team. The thing that was most impressive was the patience (Markkanen) showed on that play (with 53.7 seconds left, a 12 footer on a switch for the 108-105 lead). He had a point guard on him and it went all the way down to two seconds and he rose up with confidence and knocked it down. And Kris' attacks on the switch is exactly what we wanted." But, alas, came probably Holiday's worst minute as a pro. There was his three-point shot foul on Barton taking a tough, long three. Then he missed a rushed three with 38.7 seconds left and Lopez rolling wide open in a 108 tie as the Bulls were trying to get a two for one situation. Barton drove and was fouled by Holiday, making one of two for a 109-108 Denver lead with 20.2 seconds left. Then came Dunn drawing the switch on the athletic Faried, dancing with the ball and then going all the way to finish for what seemed like the conclusion of a magical night for the team and the developing Dunn. "I want to go out and compete with the guys in the fourth quarter," said Dunn. "I try to show my guys I'm willing to go out and battle with them." Then came Barton easing out of the backcourt. The Bulls defense had been pushing the drive to the middle to help all game. For some reason, Holiday shaded to the inside instead to push Barton right, which was his dominant hand and where the help wasn't. Dunn was in the right corner guarding the three-point shooter, which left open an incredibly large driving lane. Barton accelerated like on an open stretch in the mountains and finished. Without a timeout, the Bulls could not get off another shot. It was a sickening way to end for the Bulls in a game with so many bright moments: A 24-8 first quarter lead and season high 39 first quarter points. So much for the slow starts. Sixty-eight points in the first half with seven of 13 threes and just five turnovers and 19 assists on 27 baskets. Sure, a bit of a third quarter stumble with four turnovers and three missed free throws to fall behind by four. But then Paul Zipser reappearing with a trio of three pointers for a 92-91 Bulls lead after three. And then after the home team took a 101-97 lead after three consecutive Bulls turnovers and eight empty possessions in nine trips, Dunn with eight fourth quarter points on drives and one short pull up rallied the Bulls into fourth quarter leads twice and it seemed a winner. "Were pushing to the middle all night long and just a mistake to let him go to the baseline side, but let me say our guys fought like hell," said Hoiberg. "Best first quarter of the season. Came out with the right mentality, really shared the ball, got a lot of really good looks. We had real good performances and battled. "Something we can learn from the way this game ended, fouling a three-point shooter and giving a guy his right hand going to the basket," lamented Hoiberg. "Hopefully be better in these types of situations; it's a great learning opportunity to finish out a game and hopefully we will be better next time." All anyone could do after that was sigh and get ready to go back for more.